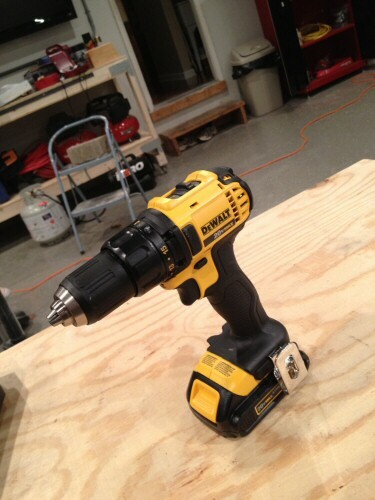 Today’s article comes to you from our workshop, where I’ve been trying out a new DeWALT 20v Max Compact Drill Driver. We asked DeWALT to ship us this model so we could run a comparison test between it and several other 18V drivers we’ve accumulated over the past year. Unfortunately, between OPC’s site improvements and several distractions, I’ve been putting off the tests required for a solid comparison article worthy of your time. Since DeWALT was kind enough to ship us the 20V Max for review, I wanted to quickly introduce it to you and give you my first impressions of the tool, especially how it stacks up against our Ridgid 18V Compact Driver, which has been my go-to driver for the last six months. 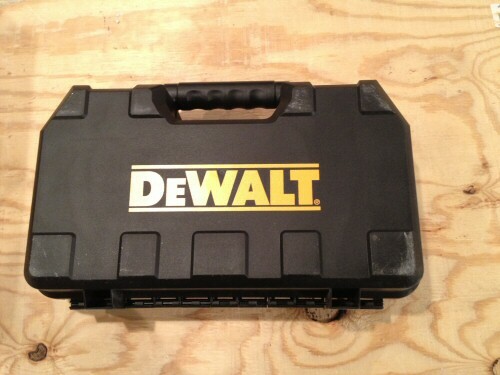 Here’s a few pictures as we unpacked the DeWALT from its classy black container. Weight: At 3.5 lbs., it’s the lightest 18V+ drill driver we’ve handled. It’s so light that it feels more like a 12V model from most other brands. Dimensions: From front to back the DeWALT is only 7.5 inches long, making it great for tight work spaces. Grip: Overall, good–but still not our favorite. Our Ridgid’s grip feel is just a little better. Trigger Feel: The trigger pull is smooth and has the right amount of resistance. It’s easy to identify and hold a speed without finger fatigue. Power Train: The DeWALT’s variable speed motor is smooth and refined, just like we expect from DeWALT. Two-speed gear box (600RPM max / 2,000 RPM max). Illumination: LED illumination placed directly above the trigger, below the shaft. We’ve grown to like Ridgid’s base illumination, which does a better job of illuminating the work space as the drill gets closer to the target. Chuck: 1/2″ heavy duty: Pretty much a standard on 18V drivers these days. The chuck is as simple to operate as you’d expect. Bit Holder: Side-mounted bit clamp proves convenient for our matching magnetic bit holder & sleeve. Battery: Very light, 1.5 amp-hour lithium ion. Standard fare for today’s drivers. We’re happy to see DeWALT and Ridgid locked in a fierce competition to produce innovation in the drill driver. These tools look very similar, and both are actually really great tools. Advantage Ridgid 18V: Slightly better grip feel; better illumination location; 1/4″ shorter front-to-back; batteries have charge indicators; lifetime warranty with registration (else 3 yr. limited warranty, which is the same as that offered by DeWALT). DeWALT measures output in UWO, while Ridgid uses Torque, making the two units difficult to compare from their marketing materials. For a quick test, I drove two randomly-selected, identical 3″ decorative brass-coated screws into the edge of a 2×4. Both drivers were attached to fully charged 1.5 amp hour batteries, and both used the same drill bit and attachment. The result? 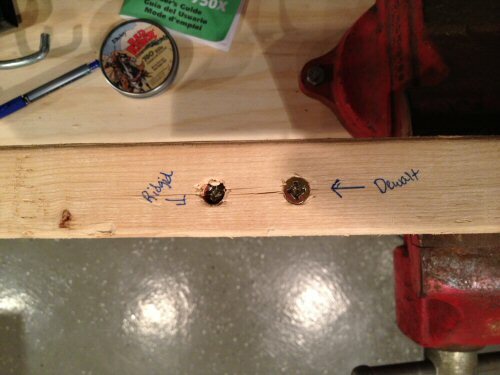 The Ridgid drove our sample screw about 1/4″ further into the wood than the DeWALT. I’ll be the first to admit that our test was anything but scientific, but the Ridgid did seem to drive stronger and more aggressively at the end than the DeWALT, which started to slow as the smooth section of the screw began entering the wood. It’s worth noting that driving power is not the only measurement of a driver’s performance. Other factors include drilling speed, battery life, battery longevity (over charges), and more, most of which we’ll be covering in our forthcoming drill driver comparison article. 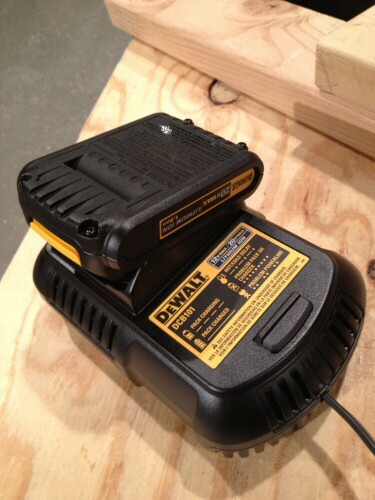 Expect to pay around $200 for the DeWALT, including the tool, battery charger, and two 1.5 amp-hour batteries. The comparable Ridgid Fuego kit, which also includes two batteries, is retailing for $180. Given the competitive features in both drivers, we think most buyers will make their decision based on brand loyalty. 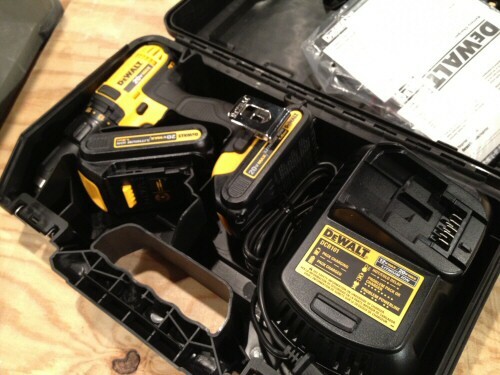 We now have five 18V+ models on hand (DeWALT, Ridgid, Kobalt, Porter Cable, and Bosch). We intend to put the whole line-up through a series of tests and get back to you will the full array of results. Since the manufacturers are giving these things to you to use and abuse, you really ought to get to the abuse part. I suggest that after you get all the regular use testing out of the way, you start doing some destructive testing. For starters, dropping them all from the same height onto various surfaces would be good. Knowing which drills and batteries won’t survive being accidentally knocked off a step ladder would be good for consumers looking to purchase a quality machine. William – we’ll incorporate a “drop test” as the last test we perform. I think the step ladder is a good choice for height. DeWalt’s latest model impact has three LED lights placed around the chuck and I expect they’ll implement that for other cordless tools going forward. I like it better than Ridgid’s base mounted light because it’s more directed toward the work surface. I’m betting they put the battery charge indicator on the small batteries in the future as well. I was surprised that they only have it in the 3.0 when they announced it in FL. This feature has definitely reached what we would consider to be standard at this point. I was surprised not to see it on the batteries from this 2011 model. Really looking forward to this comparison. Definitely second William’s comment as to drop height. Also, it’d be interesting to know which items come to an immediate stop when the button is released and which continue to spin. I’m not sure if that’s considered an electric break (similarly to what you find on some saws), but you get the idea of what I’m after, I’m sure. Simon, both the DeWALT and the Ridgid have some an electro-mechanical stop mechanism that engages very quickly when the trigger is released. There is no overspin on these drivers, which is nice. When you drove those two screws, which one went first? I noticed they’re pretty close together, so driving one might have affected the other. What bit did you use to drive those screws, I see they have a proprietary head design, did you use the matching bit? or just the one that came with the drill. Incidentally, I find myself using my impact driver more and more for driving screws, its just such a better experience than trying to fight the torque and apply the pressure required to fully drive a long screw. Though I am sure the pressure is a little easier with a square or pozidrive head, since they’re designed NOT to cam out. I also found Bosch makes some really nice Phillips bits that have ridges on the tip to better engage the screw (and they do!). I also find the Bosch bits with the ridges will engage screws better. Maybe for your upcoming tests, you can use square drive bits and screws so the bit itself is taken out of the equation. Byeedo. I think this is the first time I’ve seen you comment, so welcome to OPC! Hopefully you’ve already created an account and are earning some points!. I like the idea of using a square drive for the tests… The choice of phillips for this test had more to do with the screws I had on hand on short notice. The larger test will be better planned out…. Random side question, do other people recognize pozidrive screws? I see them all the time in IKEA stuff. Is there something in the OPC archives about the different types of driving bits, how to recognize them (and their associated fasteners), and their advantages? That is actually a phillips head, but because the screws are a soft metal, and I’m mis-using them, they got somewhat marred. I thought about whether the drive order mattered, and to be fair, I drove the Ridgid second. I’m going to head back out to the shop tonight and reverse the order. I’ll report back, but I actually expect it won’t matter. The Ridgid truly gave me the impression it was driving harder. I used a DeWALT universal magnetic bit holder in both the DeWALT and the Ridgid for the test. As for impact drivers, that’s basically all we use for driving at this point too–the ease is just unbeatable; but many homeowners will buy only one tool, so I think driving power is a fair core comparison method. Just ran out to the shop and spun down two more screws – this time spacing them far apart and using the same batteries attached to the tools from last night. 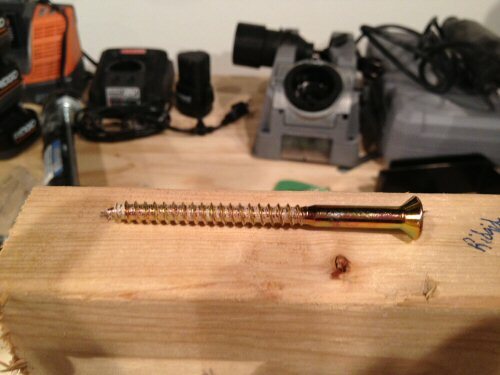 The Ridgid drove a 3.5″ decking screw around 3/4″ below the wood surface before snapping the bit off. The Dewalt fully sunk the 3.5″ decking screw, but it would not drive it below the surface of the wood (and the bit was preserved). I’m confident the Ridgid delivers more torque…. but again, that doesn’t necessarily speak to drilling power, battery life, etc. That’ll all factor into our larger test. Excellent, thanks for reporting back, good to know that the results were in line with the earlier test. What made me think about it was the fact that I could see the split in the wood from one screw reaching all the way over to the other one. How did you snap the bit off? was it just that deep? Can’t wait for the review. I’d love to replace my husband’s old, cheap Ryobi for his birthday in March! You really can’t go wrong with the DeWALT or Ridgid. There is definitely a quality difference among drill drivers, and the nicer ones (like the models discussed here) are a little pricier, but will last and will be better all around to use. 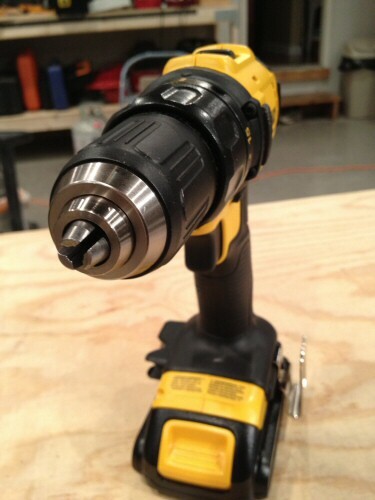 You might also consider looking into an impact driver / drill driver kit. Impact drivers are much more powerful, but they are generally used only for driving screws. One of the bigger challenges in buying a drill driver, or any cordless tool for that matter, is that much of the decision should be based on durability and longevity characteristics which are not readily apparent from the packaging. I have a lot of faith in DeWALT from a brand perspective, and a growing amount of faith in Ridgid, because I see the parent company (TTI) really trying to invest and innovate. 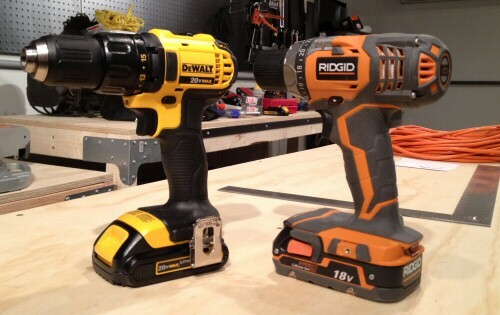 A big differentiator for both DeWALT and Ridgid are the compact forms of these drivers. These tools are literally smaller than comparable previous-generation 12 volt models (with the exception that the 18v batteries on both are still a little bigger). 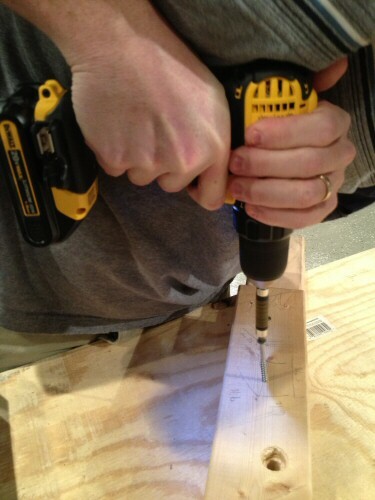 At 3.5 lbs., the DeWALT is really, really light. I think the next innovation we’ll see out from both is brushless motors for the drivers. (DeWALT already has a brushless impact driver either out or coming out soon — and I’d expect Ridgid to follow suit). I’m surprised brushless motor technology is just starting to show up in these types of tools. I suspect it will make a big difference in battery life alone given it should generate less heat. I still have my 12 volt DeWalt I got 6 years ago as a bachelor gift for my wedding and it’s still going strong. I only just recently replaced one of the two original batteries and I use it all the time. I too have an older DeWalt 12 V. drill driver that I purchased in 1997, and I didn’t have to replace the batteries until last fall. I was really surprised at the longevity, since the drill is used constantly on the job, as well as at home. I anticipate good things from DeWalt in the future , including the brushless motors. My wife and I just screwed down our subfloor with 300+ #10-3″ Spax screws (really great product IMHO: http://goo.gl/dX3JT) to eliminate squeaks prior to reflooring. I was worried about the strain this amount of work would put on the batteries, so I purchases a corded DeWalt driver for peace of mind. In hindsight I was happy with the decision (and I got another tool out of it =) ). I would be interested to learn how much strain can be put on a cordless battery and whether others think this was a good decision, too (at $60) or disagree with the approach. Thanks for this review. I find it interesting that the Ridgid drove the screw deeper into the wood than the DeWalt. I would have guessed the other way around. I’ve been really impressed by that Ridgid model. I like the review. I’m considering the combo drill/driver and impact driver for both of these brands. I think they will be pretty much the same. I would ask about the led lights, meaning which is better as far as illuminating the screw. I also would like to know which of these series is better, the x4 line up or 20v max line up? Without an accurate Dewalt model number the test is meaningless. For instance the listed dimensions for Mdl 780B are 8.2 x 9.5 @ 3.2lbs. for Mdl780c2 are 9.9 x 13.9 @ 6.5lbs. Just to list two very similar model numbers. There are a wide range of models available, from a DIY drill DCD771 up into the expensive brushless drills in the 790’s.